In the original Osun Osogbo Festival tradition, the Arugba (votary maid) has to be a virgin to be able to serve the god and the community. But while it was not a strict criterion for whoever had to play the role of Arugba in Tunde Kelani's latest film that goes by the same title, the lunar-faced, dark-complexioned lady on whom the mantle fell was prepared to tread where even soldiers are scared to march. Drama apart, she conceded to pay a strategic sacrifice along the way. Although the film derives from the cultural sacrifice that the Arugba phenomenon represents. Kelani gave it an expansive treat, covering politics, health and romance. In the plot, it gets to a point where the film has to make a statement about HIV/AIDS control and prevention. Here, Arugba has to lead other characters to enjoin members of the community to go for AIDS test. Now, while on set, Awoyele felt the challenge of having to practise what she preaches. Incidentally, the setting for that particular scene is an office of the National Action on AIDS Control. 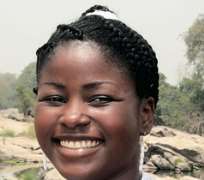 In the spirit of the Arugba sacrifice, what Awoyele, a graduate of Theatre Arts from the University of Ilorin, Kwara State, did was to voluntarily submit herself to HIV test before she entered the film world in which she beckons others to do so. “I felt I had to do it,” Awoyele says. But was she not scared that something unfavourable could result? Perhaps, the mother was banking on the largely Christian route that the family took the daughter through. For instance, she attended ECWA Nursery and Primary School and ECWA Secondary School in Ilorin, before she did an A Levels at Kwara State Polytechnic, Offa. Awoyele, indeed, notes that she was not a 'happening' girl even while in UNILORIN. ”My social life was nil,” she says, adding that her commitment to her academic pursuits outweighed every other thing. Well, her singular feat at the AIDS experts' lab fired her morale to give the film her best. Initially, when Kelani first gave her hint of the role, she was a bit puzzled about how to reconcile the film's traditional background with her Christian background. Also, having to speak Yoruba throughout first gave her some fear. But when she went through a documentary that Kelani had earlier made on the Osun Osogbo maid, she got a better idea of the script. While at UNILORIN, Awoyemi had been involved in acting. Besides, she had a flash of professional acting when she played the role of a wife in Away from Father, a film that was made in, and circulated only in Kwara area. Also, she acted in Mama Mi and Church on Fire. However, Arugba is the first major work in which she would star. And she has steadily been reaping limelight from her participation. Apart from the inroads the movie, vis-a-vis her name, have made nationally, the movie has been selected to compete at the Pan African Film and Television Festival, FESPACO 2009, holding in Ouagadougou, Burkina Faso from February 28 to March 7, while The Women of Colour Arts and Film (WOCAF) Festival in Atlanta, Georgia, USA has already programmed the film to feature at this year's festival from 19th March to 22nd March, 2009. Awoyemi is expected to be part of the train in and out. Of course, going by the precedents of actors and actresses that Kelani discovered, Awoyemi seems to have a brighter future ahead of her. Her 'predecessors', such as Kabirat Kafidipe and Kunle Afolayan, both of who first broke into light when they acted Araparegangan and Aresejabata respectively in Saworoide, have since continued to make their marks in the film industry. Also, Bukky Wright, who played Olori in the same film, has never wavered since then. Awoyemi too is hoping for the best. Already, Arugba has started its long journey through all the 57 Local Government Areas of Lagos State. As Kelani did with his earlier films such as Yellow Card and Agogo Eewo, he is showing Arugba in cinema. What makes the present treat different is the involvement of the Lagos State government which has partnered Mainframe to show the film free to Lagosians. Kelani is full of praise for the State Governor, Mr. Babatunde Fashola, and local government authorities who, he says, are also committed to mobilising for the shows. “Physical contact with the audience is a filmmaker's delight and this opportunity to observe and interact with the audience of Arugba is most appreciated,” Kelani says. “I must therefore acknowledge the visionary leadership of His Excellency, Governor Babatunde Fasola, for providing this opportunity to screen the film, Arugba, in each of the 57 Local Government councils and development areas of Lagos State. While he is happy that the film is featuring prominently at FESPACO and WOCAF, he is happier that its cinema experience is beginning from 'home'.